After finishing Cinder I was so caught up in this alternative fairy tale world that I had to go out and buy the next two books in the series. I even changed up my book choice for this category because I wanted to continue. And I have to say that Scarlet did not disappoint. At first I was a bit throw off. I had been so caught up in Cinder’s character and her world that it was a bit jarring to suddenly find myself in someone else’s. Scarlet is a spit fire of a person. She is intensely loyal and intensely hot tempered. This novel kicks off with Scarlet looking for her grandmother who she is convinced has been kidnapped. The police refuse to believe that anything untoward has happened and drop the case. Though Scarlet refuses to drop it. She decides to take up the case herself and begins her search for her grandmother. During the search she meets Wolf, a mysterious stranger and street fighter. He tells her that he will help her find her grandmother and she accepts. Together they go off into the woods in search of Michelle Benoit. I loved seeing the elements of Little Red Riding Hood being led down the path by the wolf. Scarlet is so alternately naive and worldly. She is eager to place her trust in anyone to find her beloved grandmother. But, just like Red Riding Hood, there are a few surprises in store for Scarlet. Let’s not forget Cinder. Her narrative picks up with her in a prison cell waiting to be transported to Luna. After a visit from the doctor, Cinder is able to escape the prison and sets out in search of Michelle Benoit, the woman who might have held her while she recovered from her injuries as a child. During her search, Cinder and Scarlet cross paths and Cinder’s past comes out. I won’t give too much away from the plot. 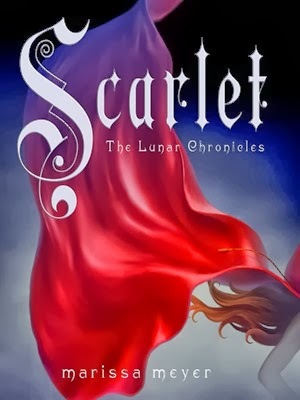 Only to say that Scarlet is a wonderful addition to the Lunar Chronicles. I can’t wait to see what’s in store for Cinder and co in Cress. Holder of a BA in English Literature, a dream of becoming an author, obsessed with coffee, and in possession of too many books and too few bookshelves.